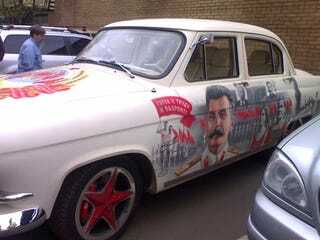 All Hail The Glorious Revolutionary Stalinmobile! At first glance we were thinking "All right, Stalin murals on a Volga- that's mildly entertaining, in a sort of twisted let's-pretend-the-gulag-never-happened way." But then we spotted the red star wheels on the thing! Da! English Russia, you're the Czar in our book.